What is the Inspiration for the Spiral Heart Moon Rod? Throughout her time as a sailor-suited soldier of love and justice, dedicating her days to boring school work and evenings to punishing evil in the name of the moon, Sailor Moon has gone through quite a few different magical items and all manners of attacks. While I’m personally a fan of the traditional Moon Stick, which I think we can all agree has a pretty lackluster name, the inspiration behind the Spiral Heart Moon Rod is fascinating in its own right. 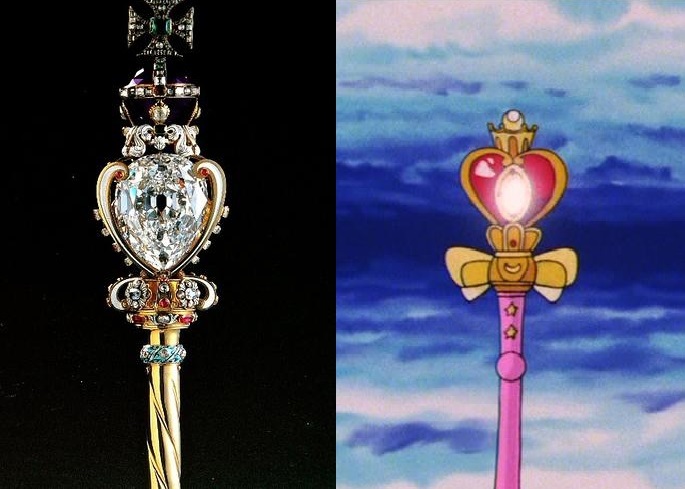 What makes the Spiral Heart Moon Rod so interesting is that its design, like the designs of other important items in the Sailor Moon canon, appears to be based on a real rod – a scepter1 – in the possession of the British Royal Family. 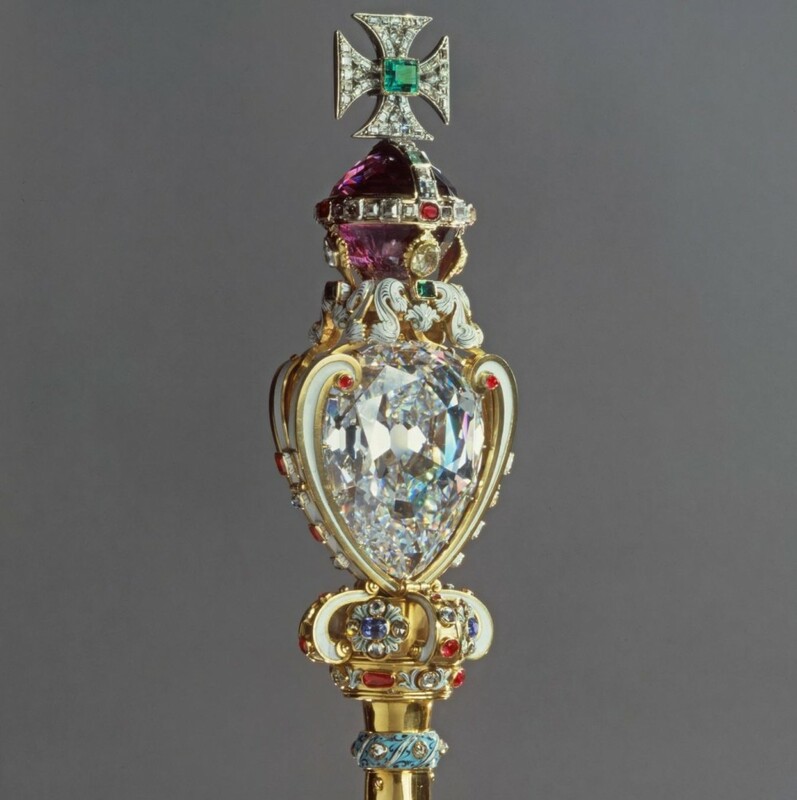 Specifically, I’m referring to the Sovereign’s Scepter with Cross,2 part of the coronation regalia of the British monarchy. 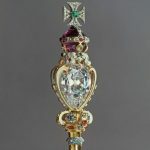 In addition to the remarkable similarities in their general appearance, which is pretty convincing in its own, it’s also noteworthy that the Sovereign’s Scepter contains within it Cullinan I,3 the clearest cut diamond in the world – not too dissimilar from the legendary Silver Crystal itself! The curving lines reminiscent of a heart, the crown design on top, and the crystal embedded within all make this a pretty convincing basis for the design. Taking into consideration that the talismans were also based on Western designs, it seems pretty fitting to me that Ms. Takeuchi would choose such a famous item from the crown jewels to use as the basis for her design. It also ties in nicely with her role as heir to the Silver Millennium and the future Neo-Queen of Crystal Tokyo. Read also: How Uncommon Are the Names of the Sailor Moon Characters? 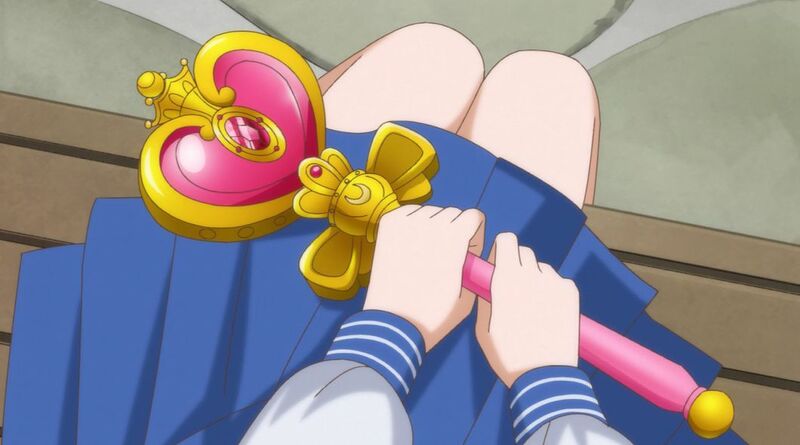 Since we know that Ms. Takeuchi incredibly well-informed and clearly did a lot of research into various crystals, I think it would definitely be worthwhile to take a closer look at some of the broaches throughout the seasons, or maybe some of the other various sticks, wands, and scepters wielded by Sailor Moon. Just seeing something real that looks so similar really gives you a sense for just how impressive her attacks must have looked to the enemies she faces. But what about you? What was your favorite of her weapons, and why? I’ve always loved the simplicity of the Moon Stick and how it even evolved once the Silver Crystal was added to it, but that’s just me. I’d love to hear other people’s opinions! ← What’s So Super About Super Sailor Moon? It’s suddenly occurred to me, just how many of Usagi’s attacks require the use of an external item. Other then the Tiara and Sonic Wail (which technically require items as well) I’ve never seen her perform an energy based attack akin to what Mars/Mercury/Venus/Jupiter etc. can summon up. Though granted her powers are more healing/purification based, and you could make the argument they are some kind of manifestation of her strength. I’d like to have seen one thing in that vein. Saturn and Pluto also fall into this category. To my knowledge all their moves require the use of the Garnet Rod/Silence Glaive to perform. Makes me wonder how they would fare if deprived of them. Taking it one step further, it’s also interesting to note that she also needs the broach to transform, which then must be on her body at all times or else she loses her powers (there is one episode where she removed her broach and stayed as Sailor Moon, but otherwise this rule was pretty consistent). Since the rest of the Sailor Soldiers simply use their transformation pen and are then done with it, it seems that the source of their power is a little bit different. I would like an idea as to why the four “gemstones” on the edge of Sailor Moon’s first brooch (I call it the Prism Brooch, although Classic Brooch would work) are in the directions they are…. I mean why is the ruby north and not east? Why is the topaz/citirne to the east and not north? Sapphire to the south and not west? Emerald to the west and not south? I understand why the “pink” pearl is in the middle….. but why the others in their locations? Thanks for the comment! I’m glad to know that other people enjoy reading this and that maybe it can provide some interesting trivia to people. Re: the orientation of the gems, I never actually thought about that much. As with the Kings and their Buddhist connections, you would naturally assume that she would have continued with that connection. The only other possibility I could think of is the colors of the planets and their order from the Sun, starting from the bottom and moving counter-clockwise (Mercury, Venus, Mars, Jupiter), but frankly that seems like it’s purely chance, since there’s no good reason to start from the bottom or move counter-clockwise. I’ll definitely need to look into it further! Great article! I don’t know how you keep finding new things like this, I would have never thought of looking up what the Heart Moon Rod is based on. Lots of misspent youth watching Sailor Moon and other anime over and over, mostly, mixed with misspent adulthood reading Japanese fan sites! But seriously, most of the articles posted here come from simple questions and wondering “Is there some reason behind that…?” and then researching. I’m always amazed at just how far Ms. Takeuchi and the anime staff went to find inspiration for their stories!